It’s farmers’ market season in Regensburg. One of the things I look forward to every year are the tiny little “Forest Blueberries” — Waldheidelbeeren — we can (sometimes) find at the Donaumarkt. They make for a nice sauce, perhaps to use with a lovely brunchy plate of crêpes. But this oppressive heat (now that it’s finally here!) calls for something more seasonally appropriate to be done with these berries. I fired up Google and found the original recipe at The Baker Chick. 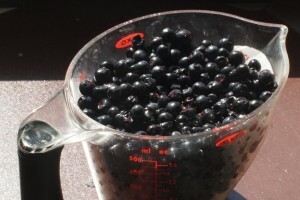 Bring blueberries, sugar and salt to a boil in a saucepan. If you’re using the little bitty wild berries, they’ll fall apart by themselves in the heat and sugar. Otherwise you can mash the berries in the pan while stirring frequently. 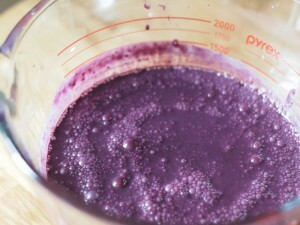 Stir the vanilla into the half-and-half, then add that into your saucy berries. Purée the mixture in a blender (or even easier: stick blenderize it in the container you’re going to chill it in, and here’s the bullet comparison in case you’ve got no blender/juicer yet). Let it get good and cool, covered, in the fridge overnight. Stir in the orangey booze just before freezing the now-chilled batter into whatever you use to churn, and freeze it overnight. Oh, yum! I just came home yesterday with…. ummm…. 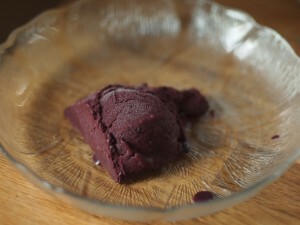 ten pounds of blueberries, and the sauce and this ice cream will be wonderful ways to use some. If I can make room in my freezer, I’m going to go get more. They’re beautiful berries – Canadian, actually, but better than anything Texas produced this year, and cheaper! Hope they taste good, too! My ‘scream came out much darker purple than the original recipe…I wonder if that’s because the berries we used are so much smaller, and have a higher surface area-to-mass ratio, which means more skin in the mix.